It is tough to resist the urge to change decor when Pinterest is filled with fall decor pictures. Inspired from super talented people out there, I finally decided to make a little fall display on our fireplace mantel too. In afterthought, I realized I do not have even a single item which can be classified as fall themed! Well.. I tried to make do with the items I had at home. The hydrangea plant in the front yard had a good blooming season. My gardener usually clip the spent blooms and throw them with grass clippings, but this time I stopped him and carefully kept the dried flowers to add to my display. The black vase set is a showpiece that use to sit by the mantel already. The dark gold/ copper-ish plates are from dollar store, I bought them last Diwali to put my clay diya. I had some photo frames on the mantel and two of them had lush greenery and waterfall pics from our trip to Hawaii and Puerto Rico, the third frame presents a picture of us from our dating days. Of course all that greenery had to go, it is fall for crying out loud. I searched through our physical picture collection but could find only one pic to fit a frame. Others were either not fall or wasn’t the right size. I was disappointed for a moment, then I decided to take things in my own hand and create a little piece to fit in the second frame. Here is the result. I have used some red card stock for base, some golden tissue paper, and glitter pen to write FALL. It seriously took me less than 10 minutes. After making all these changes, I wasn’t quite happy. The black frames were dominating the color scheme. I did a quick fix by wrapping tissue paper on frames and fixing them in the back with a little glue. and Ta-Daaa!!! I added that ‘pop’ of orange color as well. In front of the fireplace I have kept a wood log and a potpourri basket. What do you think? Convincing enough for Fall? 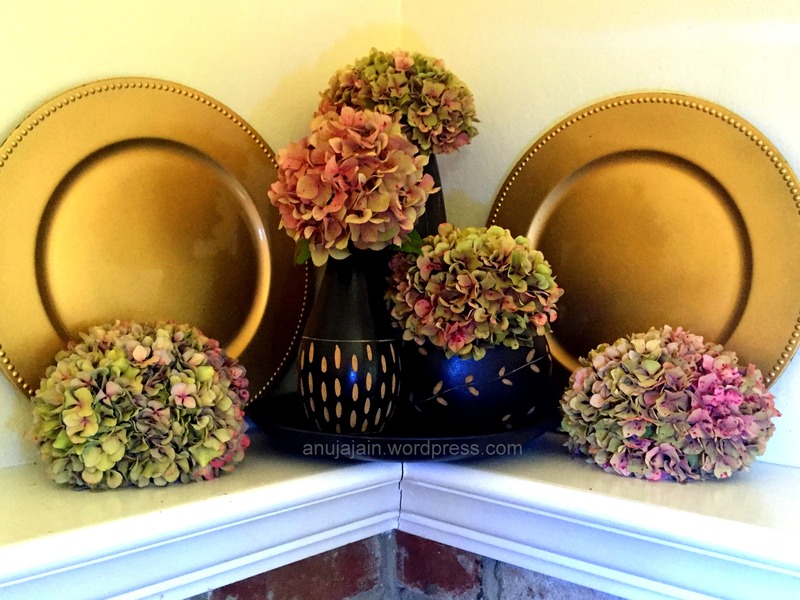 I love that you used things you already had to decorate your home for fall! Well done!